Braided flexible connectors are designed to dampen vibration, suppress noise, adjust or correct misalignment, and relieve stresses in piping systems. Working pressures are usually rated at 70°F and must be de-rated for higher operating temperatures. Stock HVAC connectors in standard lengths are usually capable of &frac18;" lateral offset. Longer lengths and shorter lengths are available when the system may require them. Female copper sweat end connectors can be fabricated in special lengths and built for higher working pressures and operating temperatures. 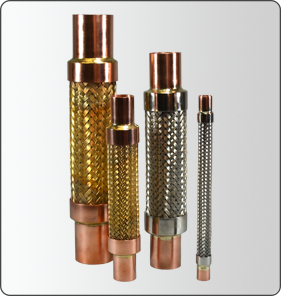 We also offer copper male NPT, copper femaie NPT and copper sweat unions.